traditional cooking from the family farm Top Tomato Foods! Cleaning Artichokes is a lot easier then one might think! Start off with a bowl of cold water and lemon juice. 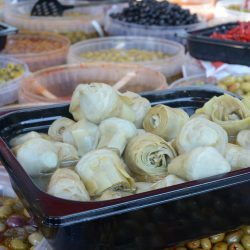 Artichokes are a leafy vegetable and as soon as you start to clean them the inner tender skin will start to oxidize and turn dark, to prevent this from happening we put the cleaned artichoke in a cold water/lemon bath. You pull the outer leaves off, trim the top and stem and drop in water. Now you are ready to cook artichokes! On stove top put 1 cup white vinegar 2 cups of water and 2 tablespoons of salt. Bring to boil. 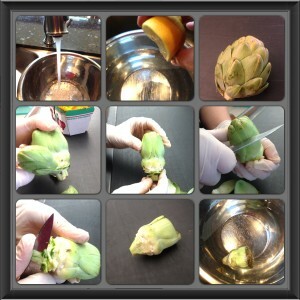 Remove from water and vinegar and place each artichoke single file on a tea towel to dry overnight. The next morning add the artichokes to the jars with one garlic clove per jar (optional). Fill the jar with canola or vegetable oil and put lid on. For best results wait 2-3 weeks prior to consumption.